In 1922, Elbert Parr Tuttle (1897-1996), then a busy Cornell law student and young father, noticed that there were very few apartments to rent in Ithaca. So the enterprising student decided to fill the need. He purchased an empty lot on Cayuga Heights Road from builder Jes J. Dall and his wife Mary Alice Dall. A March 1928 ad in the Cornell Daily Sun describes a roomy third-floor Tuttle apartment with garage. Elbert, Sara, and their son Elbert "Buddy" Jr.​ lived in one of the newly built apartments before graduation in 1923. The family subsequently moved to Atlanta, Georgia, where the top Cornell law graduate began his legal career. The Tuttles gave up their landlord roles when they sold Tuttle Apartments in 1938. ​In his early decades as a lawyer, Tuttle took on several civil rights cases in the South, notably rescuing an accused Georgia man from a mob and filing an appeal for a new trial based on due process issues. After World War II began, Tuttle took a leave from his law firm and enlisted, receiving a Bronze Star, Legion of Merit, Purple Heart with Oak Leaf Cluster, and Bronze Service Arrowhead. * Note: It's possible that the Cornell architecture graduate who designed the Tuttle Apartments is J. Lakin Baldridge. 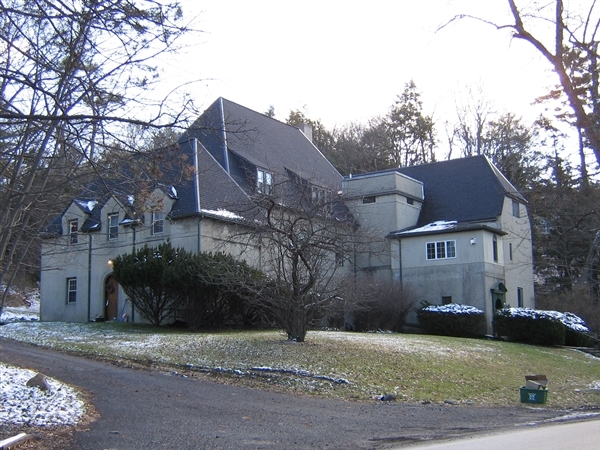 Baldridge graduated from Cornell with a Master's degree in architecture in 1922, the same year that the Tuttles purchased the lot on Cayuga Heights Road. Baldridge was a partner of builder Jes Dall, who sold the lot to the Tuttles. Baldridge and Dall went on to build many notable homes in Cayuga Heights until Baldridge's early retirement in the 1930s. Aman, Alfred C. Jr., “Elbert Parr Tuttle,” Cornell Law Review, Volume 82, Issue 1, November 1996, Article 1. Cornell University Law School Heritage Project, "Tuttle, Elbert P," May 15, 1988, various video clips. Dean, Arthur H., “Tribute to Chief Judge Elbert P. Tuttle,” Cornell Law Review, Volume 53, Issue 1, November 1967, Article 1. Emanuel, Anne, Elbert Parr Tuttle: Chief Jurist of the Civil Rights Revolution. University of Georgia Press. 2014. Carter, Jimmy , “Presidential Medal of Freedom Remarks at the Presentation Ceremony,” January 16, 1981. Online by Gerhard Peters and John T. Woolley, The American Presidency Project. http://www.presidency.ucsb.edu/ws/?pid=44540. Elson, Charles M., “Remembering Judge Elbert P. Tuttle Sr.,” Volume 82, Issue 1, November 1996, Article 2. Shaw, Michelle E., “Dr. Elbert P. Tuttle Jr., 90: Dedicated doctor and lifelong learner,” The Atlanta Journal Constitution, Friday, March 23, 2012. Steely, Mel. "Elbert Parr Tuttle (1897-1996)." New Georgia Encyclopedia. 07 August 2013. Web. 19 August 2016, http://www.georgiaencyclopedia.org/articles/history-archaeology/elbert-parr-tuttle-1897-1996. Tompkins County Clerk’s Office Deed Book 203, Page 109; November 19, 1922. (Guy H. Tuttle, Elbert’s father, is also on the deed and is listed as “owner of an undivided nine-fourteenths of the premises,” compared to Elbert’s five-fourteenth’s share. ); Tompkins County Clerk’s Office Deed Book 249, Page 436; December 24, 1938. Totenberg, Nina, “Elbert Tuttle, Quiet Civil Rights ‘Revolutionary,’” NPR Books, October 5, 2011.